‘Create a new brand and identity that is beautiful and intriguing’ was the brief from St Hugh’s Foundation for the Arts – a charity that awards grant funding to established artists and arts organisations through Annual Awards programmes and development workshops. At the root of the project was the charity’s aim to encourage more artists to apply for the grant funding and attract more Trustees. A new brand identity and subsequent design and development of a brand new website would play a significant part in affirming the charity’s role in the Arts sector. Firstly, the brand needed to truly reflect their values and purpose - to encourage the highest standards of arts practice - that would effectively translate both on and offline and, which was of course, beautiful. We explored how concepts could also convey prestige and authority, with the finalised logo featuring a copper effect gradient in a format that is suggestive of a seal or stamp of quality, merit and achievement. Built in Expression Engine, the website is fully responsive, easy to update and has scope to develop as the charity’s needs change over time. The design combines stunning imagery that reflects the breadth of art disciplines against subtle textures and a sophisticated colour palette to convey an overall effect of intrigue and quality. A dedicated area showcases previous award winners and their account of how the grant funding enabled them to pursue their arts projects with a view to inspire others to apply for the grant funding. 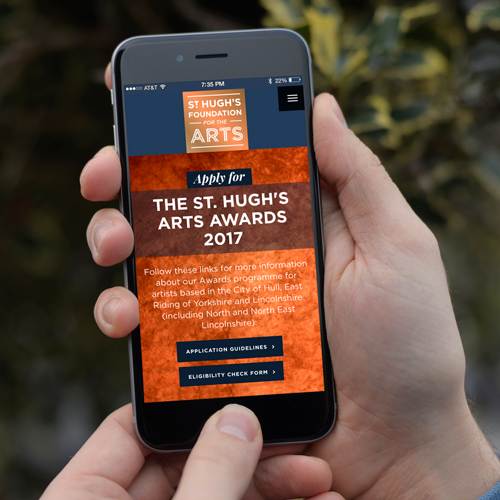 “The Trustees of the St Hugh's Foundation for the Arts have been thrilled with the results of our website redevelopment. Optima Design responded clearly and creatively to our design brief, supporting the Foundation through a period of great transition around how we wanted our work to be represented. The design process was collaborative, with plenty of opportunities to review the work either in person or online, and all queries were dealt with promptly and professionally. As a result of the launch of the new website, we have observed a substantial increase in numbers of people engaging with our work via social media, by signing up to our mailing list or by attending our events.